Webcam: Rück: 10 Megapixel (4.320 x 2.432 Pixel), RGBC-Technologie. Front: 2 Megapixel (1.920 x 1.080 Pixel). Das Motorola Moto X ist ein Mittelklasse-Smartphone und gehört in dieser Klasse zu den besseren Modellen, auch wenn die Umsetzung längst nicht perfekt ist. Dies beginnt schon bei der Außenschale, die einen eigenen Esprit vermissen lässt. Das Display ist etwas zu dunkel, der Prozessor saugt etwas zu sehr am Akku und die Kamera hat etwas zu viel Freude an der Farbe Grün. Das Moto X überzeugt mit seiner guten Verarbeitung und seiner alltagstauglichen Leistung. Positiv ist hervorzuheben, dass recht wenig vorinstallierte Apps den Speicher belegen. In unserem Test lief das Smartphone äußerst stabil. Die Benutzeroberfläche ist Android-typisch eher schmucklos gestaltet. Mit der Qualität der Spracherkennung waren wir zufrieden - perfekt ist sie indes nicht. Motorola hat beim Moto X eine Menge harte Konkurrenz auf dem Markt. Im Preisbereich von knapp 350 Euro ist nämlich auch das Nexus 5 und das LG G2 anzutreffen, welche beide über mehr Rechenleistung und ein größeres und höher aufgelöstes Display verfügen. Das Moto X punktet dafür mit Extras wie dem Active Display und der direkten Sprachsteuerung ohne vorherige Tastendrückerei. Die Idee, ein günstiges und gutes Smartphone zu schaffen, das mit dem neuesten Android sowie zahlreichen Erweiterungen angeboten wird, ist sehr gut. Leider schwächelt Motorola bei den gewählten Materialien sowie der Verarbeitung so sehr, dass das Moto X nur noch auf einem mittleren Platz zu finden ist. Auch wenn es mit tollen Funktionen sowie dem Zweijahresabo von Google Drive lockt, stört mich der Preis von 349 Euro doch zu sehr. Außerdem benötigt ihr eine neue SIM-Karte und der Speicher ist nicht erweiterbar. Das Motorola Moto X ist ein solider Allrounder ohne größere Schwächen. Pluspunkt des Smartphones sind die kompakte Bauweise bei großer Bildiagonale und die gute Sprachqualität. Softwareseitig wusste im Test nur die Active Display-Funktion zu begeistern. Die übrigen Software-Funktionen wie etwa "Touchless Control" kommen nicht über den Status Gimmick hinaus. 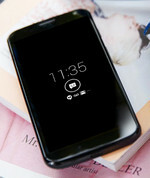 Das Moto X besitzt eines der schönsten und farbkräftigsten Smartphone-Displays. Ansonsten wirkt es mit kurzer Laufzeit und Mittelklasse-Kamera gegenüber aktuellen High-End-Smartphones eher farblos, ist mit 350 Euro Straßenpreis aber auch ein ganzes Stück billiger. Gut Ding braucht Weile. Bereits im August 2013 brachte Motorola das Moto X zusammen mit Google auf den amerikanischen Markt. Das Moto X hebt sich mit innovativer Sprachsteuerung und einem ausdauernden Akku hervor. Der nicht erweiterbare Speicher und die Kamera sind aber klare Mankos. So the second-generation Moto X is categorically better than its predecessor. Significantly so. It has a much more powerful spec, and the display is what we hoped we'd see on the 2013 version. The camera is now worth your consideration, and it is a thin and light smartphone. We liked the original Moto X, but the 2014 flavour is definitely worth the upgrade. At Rs 23,999, Motorola is easily offering the best Android experience outside the Nexus clan and we feel this is the phone to get under Rs 25,000. For this price, you’re getting features that are not available even in the most expensive Android phone today. Add to that support for Wi-Fi ‘ac’, Miracast and the latest version of Android and you have yourself a pretty future proof device. The Moto X proves that it’s not how many cores you squeeze in that matters but how you utilise them. The dual-core CPU gives even octa-core chipsets a run for their money. We had reviewed the Moto G (Review) and can attest to the fact that the Moto X runs much, much faster and smoother. Tasks like games, image editing and even routine switching between apps happen quicker. The camera is not very inspiring, and battery performance could have been better. However, the Moto X with its unique software enhancements still comes out looking like a winner. It might not be a game changer with its specifications, as there are now devices which boast octa-core processors and higher resolution screens, but the Moto X is definitely a contender in the mid-range segment. That said, it comes with a stiff price tag of Rs. 23,999 which puts it against some tough competition. 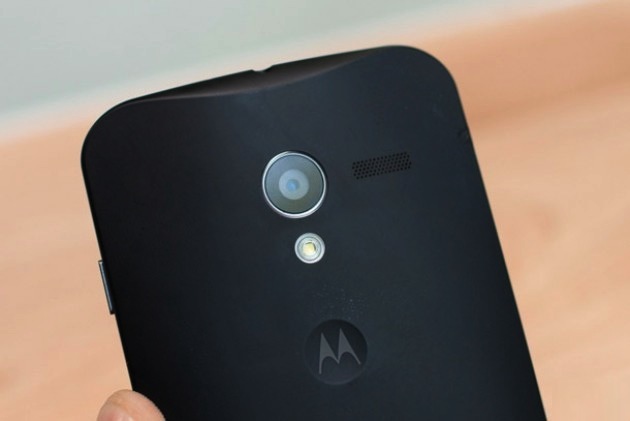 The Motorola Moto X is in direct competition with the Nexus 5. It's a little cheaper at £264 SIM free, but despite this we prefer its AMOLED screen, longer battery life and useful, innovative apps. it's fantastic value therefore and wins a Best Buy award. The Moto X and Moto G might look similar but that’s where the similarities end. The G remains one of the best budget droids around but the Moto X offers you so much more. Not only is it more powerful, it has a better display, camera, intuitive controls and fits everyone’s pocket (quite literally as well). We do have a few niggles with the phone like the over-simplistic camera UI. It would have been nice if we had the option to drop the video resolution as not everyone shoots in 1080p. Provision for a microSD card would have also been welcomed. But if you have the budget, look no further than the Moto X for the best Android experience under Rs 25,000. As a tongue-in-cheek requested, I asked “Which is the best smartphone?” Three models were mentioned but none of them had the Motorola brand. I do not think this answer had anything to do with Google’s decision to sell Motorola to Lenovo. This is an excellent smartphone. Initially it will be exclusive to Phones 4u for three months before appearing on the shelves of Carphone Warehouse, O2, Amazon and Techdata. The case is sealed meaning the battery cannot be changed and you have no expansion possibilities as there is no micro SD card slot. After their ground breaking Moto G handset recently reviewed what could Motorola produce next. It’s called the Moto X and it looks very inviting, you can get it to answer your questions and the curve in its back suits your hands shape. Why do we still call these things phones? So all in all, a nice piece of pocket hardware, if a little too wee for me. A downside I should mention: UK customers don't get offered the extensive colour customisation that was an important part of the Moto X's appeal in the US. Summing up our experience with the Motorola Moto X is fairly tricky. On the one hand, being released in the UK six months later than it should have been, the Moto X doesn't offer comparable specifications to other smartphones in its £380 price bracket, such as the Google Nexus 5. However, on many levels its software manages to countermand this. The Moto X is one of a select number of smartphones to run using the latest version of Google's operating system. Even better, Motorola has chosen not to radically change the OS's user interface and has chosen to load it with a bare minimum of custom applications, the majority of which are actually pretty useful. This not only means the Moto X is one of the most intuitive Android phones to use, it also means it's a lot faster than you'd expect. This is because the dual-core processor isn't overloaded with mundane tasks like unwanted widgets, or background tasks as it is on skinned versions of Android. The Moto X is a solid phone for Android users who are not picky about their camera. The build quality is good, and it has a few bells and whistles like Active Display that add to the overall enjoyable experience of using the phone. For UK residents, another drawback is the £399.95 price of the phone, which puts the Moto X among the most expensive in the smartphone market. When all is said and done, I am happy with the Moto X and will keep it as a backup phone. I only paid $349 (£215 or €184) for it, and it’s definitely worth that cost. It’ll be handy to pull out when I need a phone that is reliable, but it’s not a phone I will pull out to impress my friends with “a check out this cool feature” the next time we are out. Motorola has come up with a respectable phone in the Moto X, but it's far too late to the party, and it just costs too much. It's also too similar to its even lower cost sibling, the Moto G, sharing the same screen resolution, shape and nearly the same size, which makes the Moto X's far higher price questionable. It's a shame, as its touchless controls are brilliant and could signal the future for other Android phones, but for this particular blower, even with its flagship status, it's just too little, too late. For a flagship phone the Moto X comes in at a very reasonable price. Performance and software are both excellent but the device is lacking that premium feel and is a little way behind the leaders in some areas. Unfortunately, Motorola spent too long bringing it to the UK and without the Moto Maker, so the Sony Xperia Z1 Compact and Nexus 5 are better alternatives. The Moto X is probably the best phone Motorola has ever produced. While it doesn’t push the boundaries for processing performance, photographic skills or screen size, it’s a phone that’s designed to be easy to live with and easy to use – and it hits its marks perfectly. The long battery life, sturdy build, pocket-friendly size and various user-orientated interface tweaks and apps make the X one of the friendliest smartphones around. On paper, the Moto X is already fighting a losing battle, it has lost its USP in the form of Moto Maker so you'll only be able to buy it in either Black or White and specs-wise it's down against the Nexus 5 by a considerable margin, despite actually costing more. Of course what you buy isn't just a bunch of numbers and sales jargon, it's a device which you have to use every single day and night, and it's on that basis that we'll judge the Moto X. Where the Motorola Moto G dazzled us with its competitive specs and ridiculously low price tag, the Motorola Moto X falls slightly short on all fronts on first impressions. The middling array of specs see the Moto X mixing with the masses, with no discernible feature or pricing miracle to transform it from obscurity. When Republic Wireless first debuted its service, it was a less-than-satisfactory experience. Not only could you not easily transition from Wi-Fi to a cellular network, but the Motorola Defy phone offered by the provider was ancient. The new Moto X changes all that. Not only is this one of the more innovative handsets, but Republic Wireless has managed to make the handoff between Wi-Fi and LTE networks nearly seamless. The T-Mobile Moto X is physically identical to the Verizon and Sprint models (except without any carrier logo at all), so go look at our full review of the Verizon Moto X for a basic rundown of its hand-friendly design. We'll focus on the differences here. Our Editors' Choice on T-Mobile stays the Samsung Galaxy S4, both for the reasons I explain in the Verizon review and because T-Mobile refuses to offer the Moto X with its equipment installment plan. It's tempting to write off the Moto X for its midrange specs when compared with heavy-hitters such as the HTC One and Samsung Galaxy S4. Don't. We love having a personal assistant that answers to our voice without touching the phone, as well as the ability to glance notifications with no effort. There really aren't too many downsides to the Moto X. The rear 10MP camera isn't at the top of its class, and the lack of storage expansion will undoubtedly turn some people off. It's also frustrating that the Moto Maker website -- which allows users to choose the color and accent hues of their phone prior to shipment -- is only available to AT&T customers. We’re disappointed that the Moto X isn’t making its way to the UK, because it’s one of the best phones Motorola has ever produced. While it doesn’t push the boundaries for processing performance, photographic skills or screen size, it’s a phone that’s designed to be easy to live with and easy to use – and it hits its marks perfectly. The long battery life, sturdy build, pocket-friendly size and various user-orientated interface tweaks and apps make the X one of the friendliest smartphones around. I have my reservations about the Moto X shipping with an older version of Android and I question how well the X8 system architecture will perform a year from now, but I think Motorola and Google have a winner with their latest handset. It’s not quite a Nexus, but it’s the closest you’re going to get to one while still being on contract somewhere other than T-Mobile. The Moto X delivers a great user experience. I really enjoyed the effort and the attention to detail that went into its software and settings. Thanks to Motorola’s efforts, Google Now is closer and more useful than ever, and it feels like every Android phone should work in such an unobtrusive way. I have to give Motorola and Google some credit: They've demonstrated that we don't need bleeding-edge specs to get a solid smartphone experience. The Moto X announcement may not have lived up to everyone's hype, but the phone itself is still worth considering. At $200 on contract, you're getting a phone that performs as well as "high-end" smartphones like the HTC One and Samsung Galaxy S4 while still offering helpful extras like Touchless Control and Active Display. I have my reservations about the Moto X shipping with an older version of Android and I question how well the X8 system architecture will perform a year from now, but I think Motorola and Google have a winner with their latest handset. I like the Moto X. I really, really do. It's the smartest smart object I'm currently carrying on my person and I'm too used to that Active Display to calmly resume life with my DNA. That affinity, however, doesn't necessarily mean I'd buy it if given the chance. The Moto X is a smartphone that actually makes you feel smarter. We love telling Google Now what to do from across the room, knowing what alert is waiting for us before we unlock the device and firing up the camera without even having to think about it. Moto Maker customization is a breath of fresh air for smartphones. Moto X phone comes loaded with Android 4.2.2 software, but the Android 4.3 update is to be expected fairly soon. AT&T is getting the Moto X phone first in black and white, but we know the new Motorola phone will come in various colors and customizations. AT&T and later other carriers will add their own apps to Moto X phone. These two handsets are both great, evenly matched for storage, camera and battery life. We expect that no-one would be disappointed with the purchase of either. The Moto X is bigger and bulkier but has a bigger screen. It also has better specs although in real-world terms you won't notice the difference. You will, however, notice the extra £100 you have in your pocket after choosing the Moto X rather than the iPhone 5C. So unless you are wedded to the idea of having an iPhone, we can't honestly recommend you choose the 5C over the Moto X. The Motorola Moto X gets a lot of things right. It’s halfway to becoming a Nexus-style 'Google' phone, with an interface that’s almost entirely vanilla – although you still won’t get updates as soon as you would with a Nexus device. It’s also quite small for a phone that sits at the top of a company’s range. It has the same size screen as an HTC One, but is a good deal smaller. This is a phone that is tremendously easy to get on with in almost every respect. HTC One vs Moto X comparison review: Which Android smartphone is best? So the Moto X is making its way to the UK but how does it fare against one of the best smartphone from last year, the HTC One? Find out in our HTC One vs Moto X comparison review. With the same screen size, and both running Android, the Moto X and HTC One might seem like similar smartphones. But they have their differences and we're here to point them out for you. Motorola gehört nun Google und das Moto X ist das erste Angebot des neuen Besitzers. Sein Aussehen ist einfach mit einer Bauhöhe von 10.4 mm, die an den Kanten auf 5,6 mm verjüngt wird und einem leichten Gewicht von 130 Gramm. Leider wirkt das Plastik-Aussehen des Moto X nicht robust und die Verarbeitungsqualität nicht hoch. Die Kunststoff-Tasten fühlen sich dünn und wackelig an. Der Schein trügt jedoch, denn die Konstruktion hält harten Stürzen und Stößen stand. Sollte das Aussehen nicht gefallen, so gibt es ein versprochenes Moto-Maker Feature, mit welchem die Farbe angepasst werden kann und Hinweise auf ein kommendes hölzernes Moto X. Der 4,7-Zoll AMOLED-Bildschirm mit einer Auflösung von 720p bietet lebendige, satte Farben. Die größte Stärke des Geräts liegt in den Optimierungen und Features der Motorola Software. Eines davon ist Active Display. Sensoren beleuchten den Bildschirm, wenn das Gerät aus einer Tasche gezogen oder gewendet wird, oder eine neue Benachrichtigung verfügbar ist. Das macht wiederholtes Überprüfen von Uhrzeit und Benachrichtigungen sehr einfach. Ein anderes noch außergewöhnlicheres Merkmal des Moto X ist seine unglaubliche, revolutionäre Akkulaufzeit von 24 Stunden. Der Preis entspricht den hochwertigsten Smartphones am Markt, nicht jedoch die Leistung. Obwohl das Moto X in diesem Aspekt nicht mithalten kann, gibt es eigene Gründe, es zu mögen. S4 Pro MSM8960DT: Dual-Core-SoC der Mittelklasse von Qualcomm, taktet mit bis zu 1,7 GHz. Basiert auf der Krait-Architektur und wird in 28nm gefertigt.» Weitere Infos gibt es in unserem Prozessorvergleich Vergleich mobiler Prozessoren und der Prozessoren Benchmarkliste . 0.13 kg: Es gibt nur wenige Smartphones, die so leicht sind. 82.08%: Diese Bewertung muss man eigentlich als durchschnittlich ansehen, denn es gibt etwa ebenso viele Notebooks mit besseren Beurteilungen wie Schlechteren. Die Verbalbeurteilungen klingen aber oft besser als sie wirklich sind, denn richtig gelästert wird über Notebooks eher selten. Obwohl dieser Bereich offiziell meist einem "Befriedigend" entspricht, passt oft eher "mäßiger Durchschnitt".